Omotesando Lucky Street (表参道開運通り）is the shopping district around Naritasan Shinshoji Temple. There are many gift shops, restaurants and food stands. Some the building are remaining since Edo period, and entire looks are still preserved as the Edo period. There is parking, but hard to move a car. 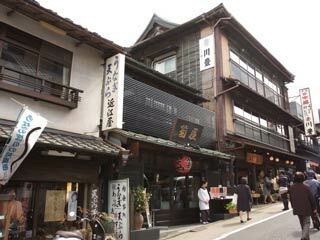 This area had been popular tourist spots since Edo period. Because many people had visited Shinshoji Temple during the Edo period, this was the post town for all the travelers. There are many hotels and inns which still has the exact look or use the same building since that time. There are many gift shops which sale ordinary souvenirs and local food. Especially, this is famous for its Unagi, Japanese eel.